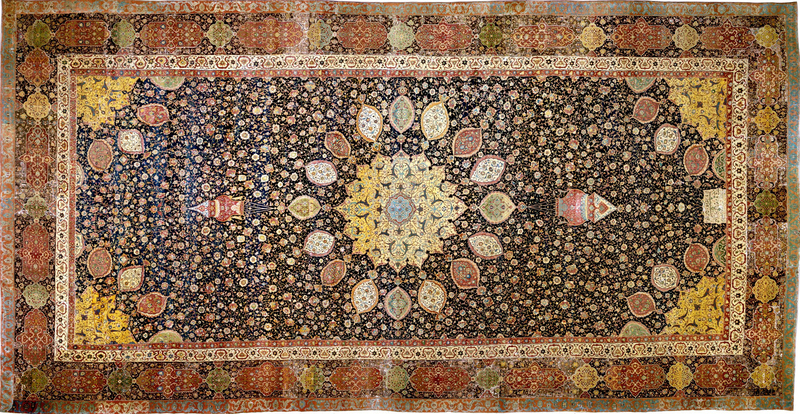 Did you know that a 9'x12' hand-knotted Persian rug can take 4-5 artisans roughly 14 months to complete? I don't know about you, but when I learned this recently at a networking event I was about ready to jump out of my seat! While oriental rugs may not be a luxury we can all afford, the materials used in the production process makes them highly desirable. So why should you know what materials to look for when shopping for rugs? Knowing this allows you to factor in your lifestyle and how you use your space to choose the best one. You need to pick the right rug the FIRST time around. Now let's dive right in and discuss the pros and cons of each type to see what best suits your needs! Don't let the word 'synthetic' fool you, these kinds of rugs are straightforward to clean and a great option if you have messy kids! Chances are if you found a great deal on a rug that it's probably filled with synthetic fibers ranging from acrylic to polyester and polypropylene giving you the best bang for your buck. Things to consider: Of course, all of those excellent properties means that you sacrifice the suppleness of other natural materials like wool and cotton. It's also safe to say that if your the kind of person that hates using plastic you'd probably avoid this at all costs. Best for: Hallways, high-traffic areas and sunny areas (think outdoors!). To be honest, I may be a little biased towards wool. I try to specify wool whenever I can for my clients as it is naturally water repellent, easy to clean, has fantastic insulating properties and is very durable. Things to consider: Of course every good thing has a few drawbacks including its ability to smell in damp places. Think wet dog smell; nobody wants that lingering around. Furthermore, you may notice a little bit of shedding will occur at first but not to worry, it will lessen over time. *Tip of the Day* Did you know you can get rid of those pesky furniture leg indentations in a wool rug with a little bit of steam? Well, now you do! Best for: Living rooms, dining rooms, high-traffic areas. Cotton is another excellent option if you'd like some of the cleaning properties of wool but don't quite have the budget for it. Aside from coming in many different colors and being reasonably easy to clean it is also hypoallergenic just like wool! Things to consider: Unfortunately due to their cheap price tag, cotton rugs don't always wear well over long periods of time and are prone to fading. You can avoid this by keeping it out of sunny areas. Best for Kitchens, casual spaces and children's rooms. If your sporting your favorite silk pajamas (or wishing you had some like me!) why not opt for a silk rug? Its beautiful sheen, sumptuous feel, and fine fibers allow for even the tiniest of details to shine. It is also widely used in Oriental and Persian rugs. Things to consider: Unlike other types of rugs that can be spot cleaned, silk rugs require professional cleaning and shows footprints quickly due to its fine fiber construction. Moreover, the old saying 'silk is worth its weight in gold' still rings true making it fall on the pricey end of the spectrum. Best for: Bedrooms and low-traffic areas. While Sea Grass, Jute, and Sisal fall under this category, their rugged and earthy look are easy to identify! Typically flat-woven in various shades of beige, these rugs are incredibly durable. They are free of chemical processing and are made from renewable resources making them a great option if you're looking out for mother earth! Things to consider: Be careful having these beauties around animals; especially cats. Also, it's important to keep in mind that some varieties may be coarse so you'll want to feel them in person to see if they are to your liking. Water is also a big no-no so keep this away from humid areas. Best for: Kitchens and more casual spaces. If you're looking for something unique and ready to feed your wild side, this may be the perfect option for you! Animal Skins (or hides) can come in all different shapes, sizes, even colors! They are also extremely durable, easy to clean and soft to the touch. Things to consider: Aside from the price the only real drawback of animals skins is that just like wool it doesn't do well in damp or humid areas (remember the wet dog smell I mentioned earlier?). Best for: Bedrooms, office, dens, low-traffic areas....pretty much anywhere. Now that your armed with knowledge about different options, go out there and pick the best rug for your space! Did you learn something new about materials in rugs? Which one of the rugs shown is your favorite? I'd love to hear your thoughts! Contact Olivia and Co. for more interior design ideas.